PLEASE NOTE Order processing times have temporarily changed while we travel out of state. Orders placed between April 17 - April 24 will ship between April 26 - May 3. Thank you for your patience! 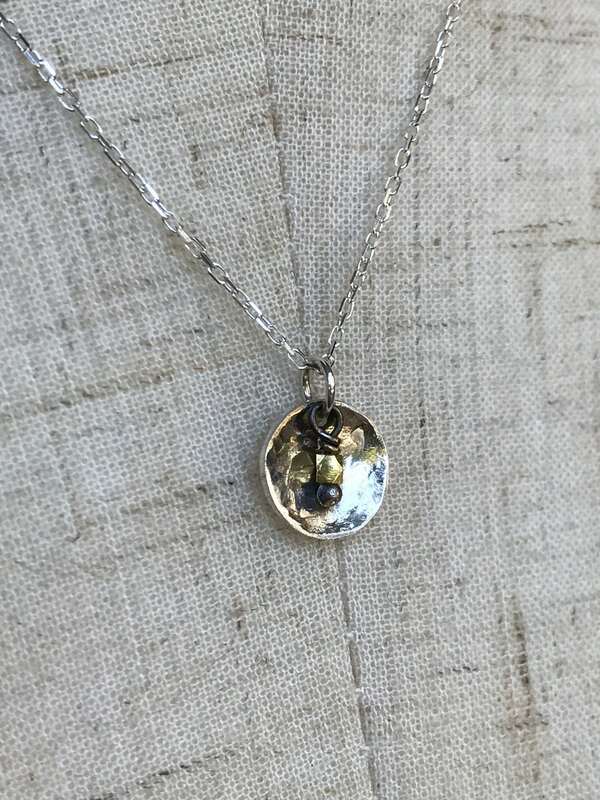 This elegant little sterling silver concave disk necklace features subtle hammered texture, beautiful light play, minimalist design, and mixed metal versatility with two 14k solid gold hexagonal beads (one front and one at the clasp). It might just be your new favorite necklace to wear everyday. 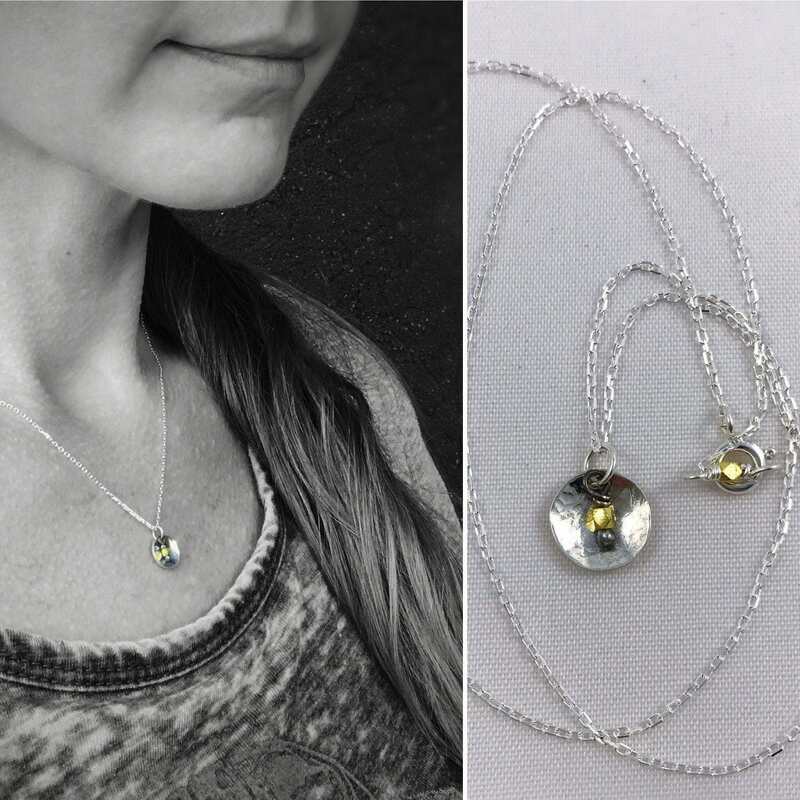 Worn alone or layered with other necklaces, the gold and silver design looks great with just about anything. This necklace is made to order just for you with your desired chain length, just select your length from the drop down menu. -Pendant is a 20 gauge sterling disk about 9.5mm diameter (3/8") , hammer textured and formed into a concave shape with nice subtle texture which cups the gold bead and catches light. -A gorgeous little 14k solid gold 2mm hexagonal bead dangles at the center of the disk from a fire torched sterling silver headpin. Headpin is left dark from fire torching to add contrast and visual interest. 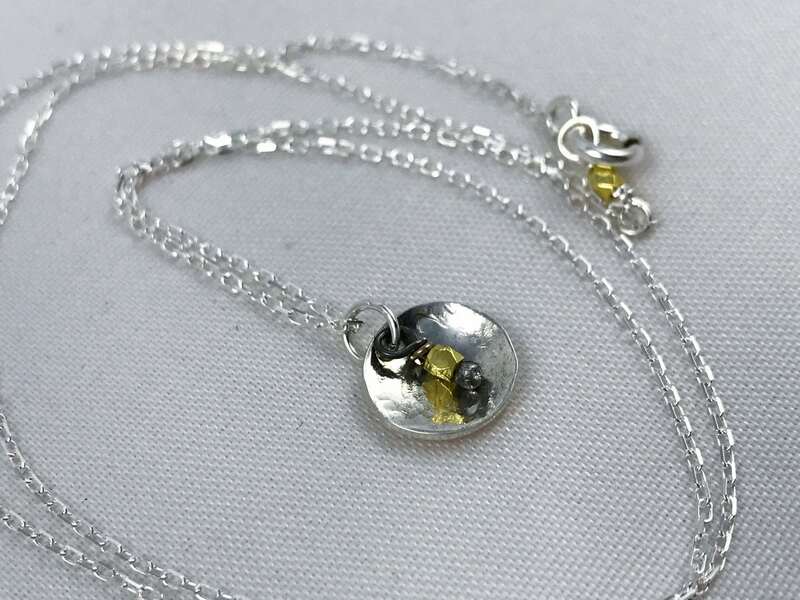 -Dangles from a 1mm solid sterling silver diamond cut cable chain which is faceted to catch light. It looks delicate but is quite strong. -Clasp is a sterling silver spring ring, and the loop on the opposite end of the chain features another 14k solid gold 2mm hexagonal bead adding visual interest to the back of the necklace. -Custom sized to your requested chain length, please select length from the drop menu. 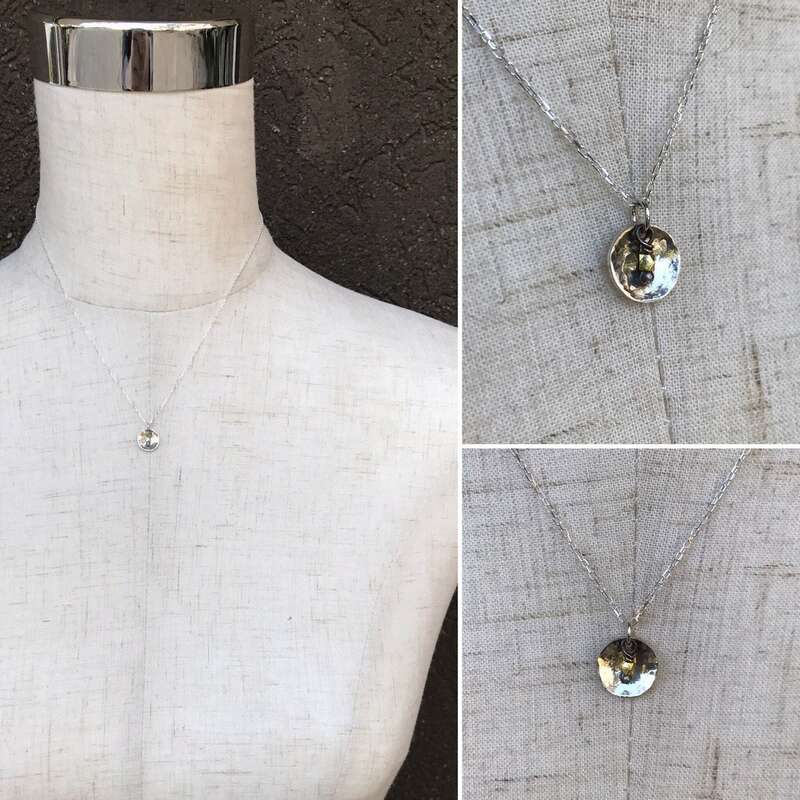 Necklace shown in photos is 17"
I named this the "Mini Gong" necklace because the shape and contrast make me think of a tiny hammered gong with golden mallet. Thank you so much for visiting my shop! If you have any questions about this design or any of the designs in my shop, please contact me, I'm happy to help! If you already know your desired necklace length, simply select it from the drop down menu. Sizes are listed by the inch. If you would like an in between size (example 18 1/2") please select the closest size from the menu and then leave me a note at checkout requesting the size. I will accommodate the size request as closely as possible. If you don't know what length you need, here's how to measure to get the proper size. Take a flexible tape measure and drape it around your neck at the length you want the necklace to lay. The measurement where the two ends meet is your necklace length. If you don't have a tape measure handy, you can use a string and a flat ruler. Simply drape the string around your neck in the same way as you would with a tape measure. Pinch the string on each end where the two ends meet, and then place that section of string against a flat ruler to get your measurement. 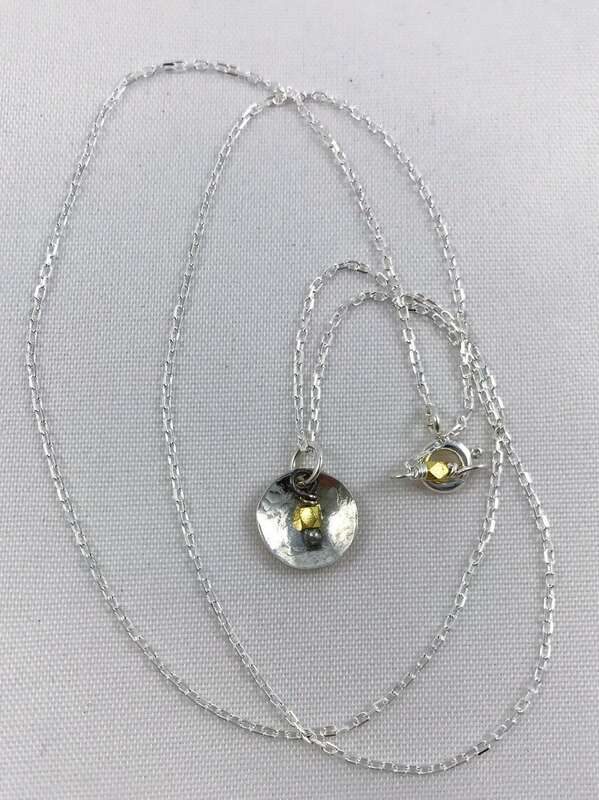 You can also measure the length of a necklace you own that fits how you like in order to get your measurement, but if you choose this method please try to measure a necklace that is of a similar style to this one or at least is designed to lay the same way. Different necklace styles can fit very differently even if they are the same length measured end to end. That's it! Then choose your necklace measurement from the drop down menu and I will create your necklace to your desired length. -Service providers. I engage certain trusted third parties to perform functions and provide services to my shop, such as delivery companies. I will share your personal information with these third parties, but only to the extent necessary to perform these services. -Business transfers. If I sell or merge my business, I may disclose your information as part of that transaction, only to the extent permitted by law. -Compliance with laws. I may collect, use, retain, and share your information if I have a good faith belief that it is reasonably necessary to: (a) respond to legal process or to government requests; (b) enforce my agreements, terms and policies; (c) prevent, investigate, and address fraud and other illegal activity, security, or technical issues; or (d) protect the rights, property, and safety of my customers, or others. The United States, European Economic Area (“EEA”) Member States, and other countries all have different laws. When your information is moved from your home country to another country, the laws and rules that protect your personal information in the country to which your information is transferred may be different from those in the country in which you live. For example, the circumstances in which law enforcement can access personal information may vary from country to country. In particular, if your information is in the US, it may be accessed by government authorities in accordance with US law. To the extent that I am deemed to transfer personal information outside of the EEA, I rely on Privacy Shield as the legal basis for the transfer, as Google Cloud and Google LLC are Privacy Shield certified. -Access. You may have the right to access and receive a copy of the personal information I hold about you by contacting me using the contact information below. -Change, restrict, delete. You may also have rights to change, restrict my use of, or delete your personal information. Absent exceptional circumstances (such as where I am required to store data for legal reasons) I will generally delete your personal information upon request. -Object. You can object to (1) my processing of some of your information based on my legitimate interests and (2) receiving marketing messages from me after providing your express consent to receive them. In such cases, I will delete your personal information unless I have compelling and legitimate grounds to continue using that information or if it is needed for legal reasons. -Complain. If you wish to raise a concern about my use of your information, you have the right to do so with your local data protection authority. All orders will arrive to you packaged in a gift box, perfect for giving (or keeping)! If you select "This item is a gift" at checkout, a gift receipt will be included in the package in place of a standard receipt. Gift receipts do not show item pricing or shipping costs. You may include a personalized gift note to the recipient as well, simply type it in the gift note box at checkout. We welcome custom and personalized orders! Most custom orders require 3-5 business days to complete. Under special circumstances this time may be longer, and we will always keep you updated on the progress of your order. Please see individual item descriptions for detailed sizing guidelines. If you have any questions about sizing, please don't hesitate to contact me, I'm happy to help! Wholesale inquiries are welcome, please contact me for more information. Please feel free to reach out to me with any questions about caring for your Klee Angelie jewelry. I'm happy to help! Some items will have individual care instructions and information about the materials in the item descriptions. Gold filled jewelry is created using a sheet of solid gold, which must constitute at least 5% (1/20) of the items total weight, which is pressure and heat bonded to a sterling silver or base metal core (such as jeweler's brass). Creating gold filled materials is a unique and technical process, and only a few mills in the world do this. Gold filled items are 5-10 times thicker gold layer than regular gold plating and 15-25 times thicker than gold electroplate, making it much more valuable and longer lasting because it is a layer of actual karat gold, not a microscopic film. Gold filled does not de-laminate or peel like plated or "dipped" pieces, and with proper care it can last for as long as 30 years. Will my copper jewelry tarnish or turn my skin green? The copper used in my designs is pure, raw, solid copper. It is not treated, lacquered or coated in any way, so it will darken and develop a patina over time. For some wearers, copper will leave a temporary green mark on your skin. It washes off with soap and water, and is harmless. If you have any questions about caring for copper or wearing copper, please feel free to contact me. Are your sterling silver pieces solid sterling silver? Yes, all of my sterling silver jewelry is solid .925 sterling silver. I also use fine silver elements in some of my designs. Fine silver is 99.9% pure silver. Love this necklace and it really looks great with the earrings. Thank you.